Kryuchin is joined by a violinist, keyboard player, and, eventually, a pair of singers. The vocalists join them once the band has moved onto their second song, “Old McDonald Had A Farm,” and it’s not hard to guess who’s punctuating those E-I-E-I-Os. For their final song, the gang opts for “Murka,” an old Russian standard. That one’s slower, more melancholic, and, by the looks of it, the most difficult melody to capture via firearm. Kryuchin nails it, though, and the result is certainly beguiling. 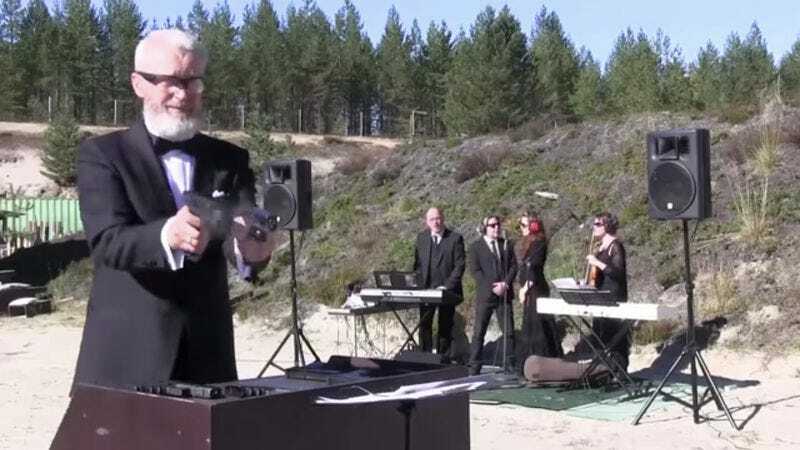 Still, who needs pistols when you can have a keytar.